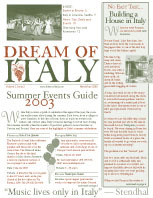 The highlights of Italy’s summer celebrations: Florence’s Festa di San Giovanni, Umbria Jazz in Perugia, the Rossini Opera Festival in Pesaro, the International Pescara Jazz Festival, Ravenna Festival Internazionale, Siena’s Palio, Festival di Due Monde in Spoleto, Torre del Lago’s Puccini Festival and the Venice International Film Festival. A personal account of all of the hard work and waiting that goes into building and owning your own Italian home. Orvieto’s Corpus Christi procession in June. Take in an opera under the stars in Verona almost every night during the summer. Spend the holidays in one of the best-kept secrets full of history and tradition that celebrates Holy Week with processions and feasts. Experience the coming of Spring with May festivals – Sposalizio dell’Albero in Vetralla and La Baraabbata in Marta. Seattle eateries dedicated to serving up authentic gelato: Gelatiamo and Dolce Vita Gelateria and Italian Cafe.